SKU: N/A. Categories: Sacred Totems, Wondrous Items. The Viking longship was perhaps the greatest technical and artistic achievement of the European dark ages. Our Viking Longship Pendant is 1 ⅜” wide by 1 ½” tall (35 x 38 mm), and is available in bronze and sterling silver. It comes with an 18” gold or silver-tone steel chain. Ships were an important part of Viking society. Their ships permitted the Vikings to embark on voyages to trade, raid, and explore. But ships were not only valued as a means of transportation – they were also valued for the prestige that it conferred on her owner and crew. 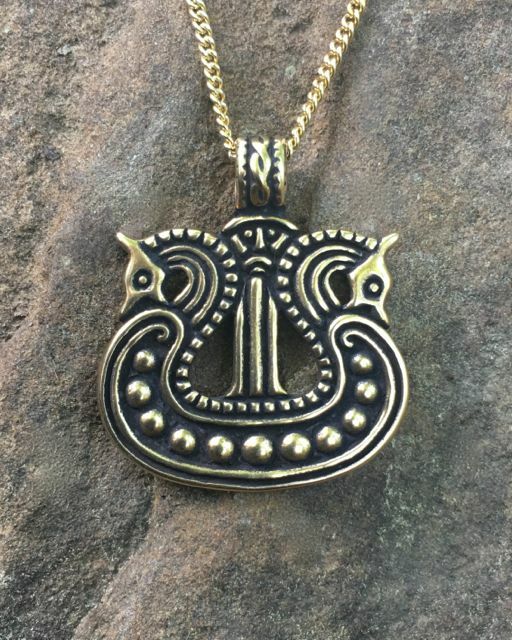 Images and likenesses of Viking ships can be found carved in wood and stone, depicted as amulets and on coins, and embroidered on clothing and banners. It was a common practice for a Viking chieftain to be buried in his ship, dressed in his finest clothing, with his most prized possessions. Often his favorite horses, a faithful hound, and sometimes even loyal servants were sacrificed during the funerary rites so that they could accompany their master into the afterlife.